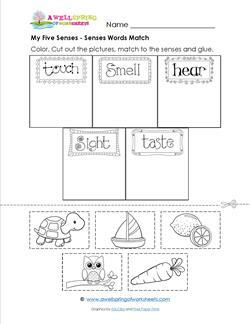 In this my five senses worksheet kids cut out the words hear, touch, smell, taste, and feel and glue them beneath the children who show that sense - eating ice cream, smelling flowers, petting a cat, and more! 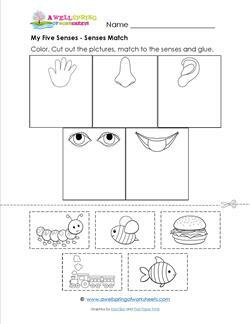 Kids get to cut, glue, and color with this my five senses worksheet! 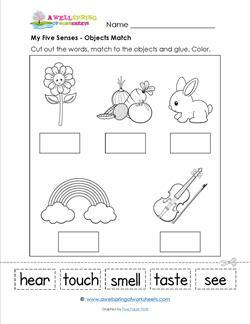 Cut out the names of the senses, match them to the objects that represent that sense, glue and color. 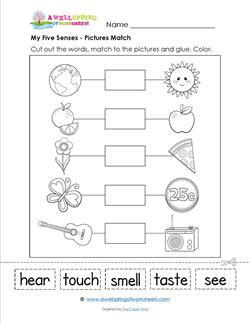 In this my five senses worksheet kids look at the two pictures and match them to one of the senses. Cut out the words, match and glue. And of course, color (the best part!). 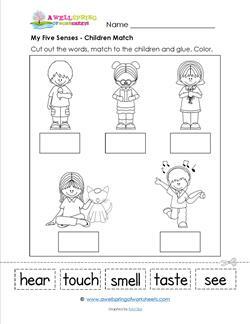 A little different from the other my five senses matching worksheets, kids cut out pictures of objects that go with one of the senses, match them to pictures of the senses, glue and color. The words for the five senses are provided in the boxes, written all fancy! Kids color first then cut out the pictures of the objects and glue in the box with the correct sense.